When passion for dogs meets excellence and the highest possible standard of care, then amazing things are born! 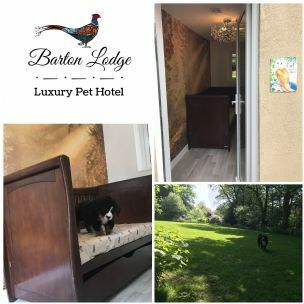 Barton Lodge Luxury Pet Hotel was created to provide complete peace-of-mind for dog owners, knowing that they can completely trust that their dog is receiving the best possible care! Our spacious, luxury accommodation includes - designer beds, state-of-the-art cctv, chandeliers, thermostatically controlled central heating, flat screen smart tv's and 24 hour access to their own individual private outside courtyard. Each dog's requirements are individual and we are happy to work with you and your dog to design the best possible exercise and care plan during their stay. We have over 3 acres of secure woodland, lawns and paddocks for your dogs to explore off-lead! A well fed dog is a happy dog and we cater for all dietary requirements, including raw feeding! We encourage you to bring your own dogs food and treats however, we are also happy provide a high quality, vet approved diet for you dogs during their stay for an additional charge. Secure Dog Freedom Field available for Private Hire! East Midlands Airport Parking and complimentary Bentley chauffeur collection and drop-off service! 6 minute drive from M1 junction 24! From M1 Junction 24 take the A453 to Mill Hill island, take the first left onto Green Street and the entrance is on the right about 3/4's of a mile, before the turn for Barton-in-Fabis village. 10 minutes drive from Nottingham City Centre!